Well, I'm back from Coachella. 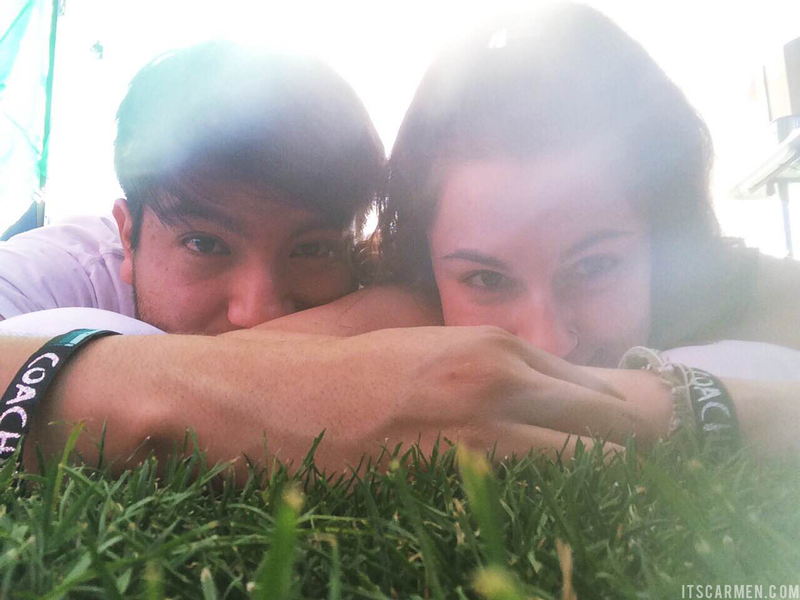 I went to Coachella Music & Arts Festival for my birthday this year. 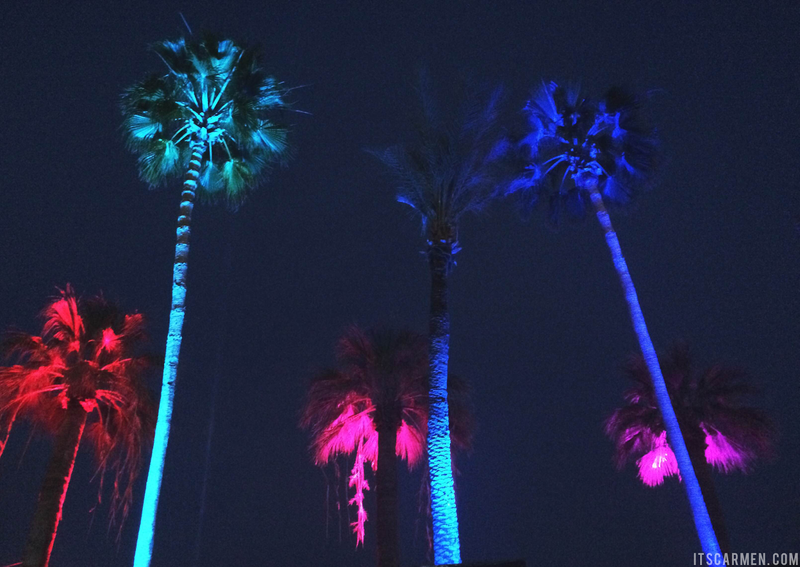 The fest, held in Indio, CA, is three days long & runs for two consecutive weekends. My boyfriend & I were able to catch Weekend 1 (April 10 -12, 2015) just in time for my 25th birthday. Since there was so much music, so much food, & so many people, I'm going to break up my recap posts by day. 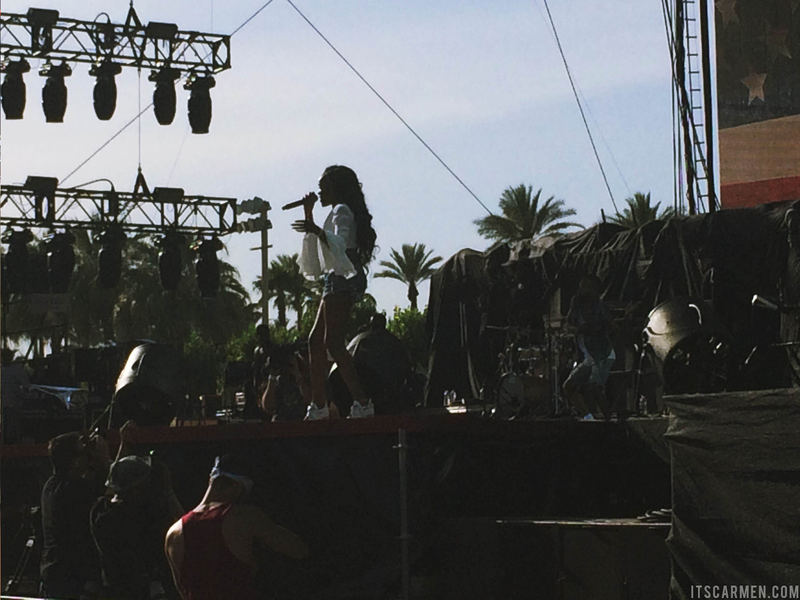 Follow along & enjoy the Coachella experience with me. Hopefully next year we can go together! Before I actually get started on Day 1 (Friday), I should preface by going over Thursday. We got to the polo fields early Thursday, around 8:30 am because we heard people start lining up for parking & that was absolutely true. We got there a little before opening (9 am) & were waiting in the long car camping line for about 90 minutes. 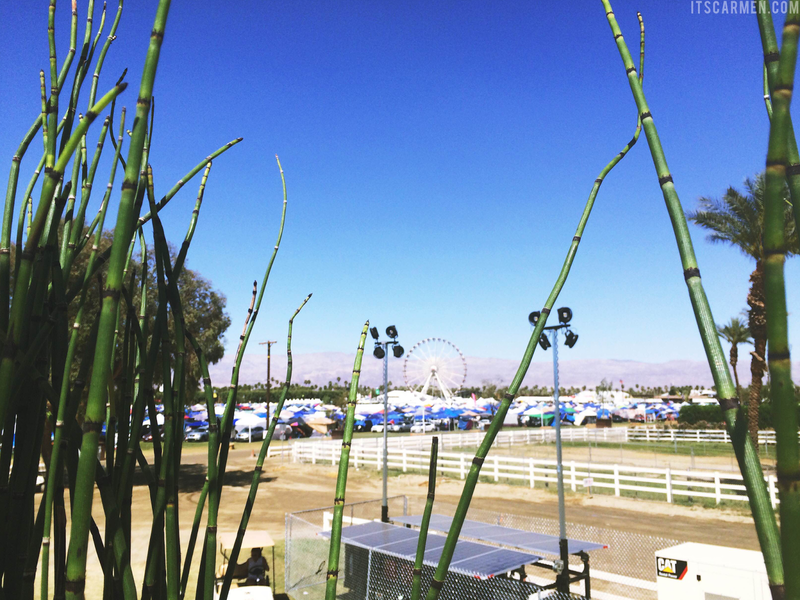 We were thankful to have made it to Lot 8 which is the closest to the Coachella grounds, making traveling from the campsite to the festival much easier & faster. We immediately got to our campsite in Lot 8 & started unpacking. By this time it was around 11 am & the rest of the campers were setting up their canopies to shield them from the scorching sun. After set up we explored the area. Since the festival was not yet open we ventured to the NRG solar charging station where you could charge your phones -- this place became increasingly busy as the day went on. 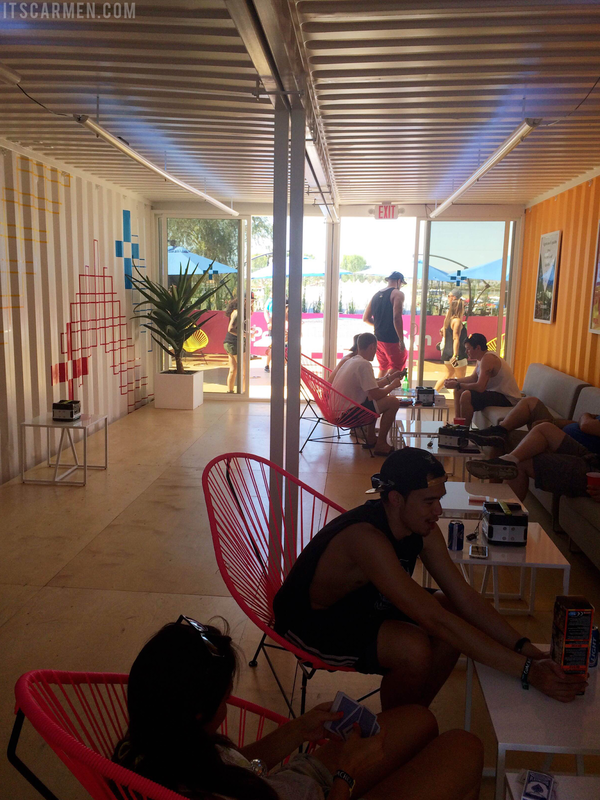 The NRG area was perfect to start off your day in the shade. 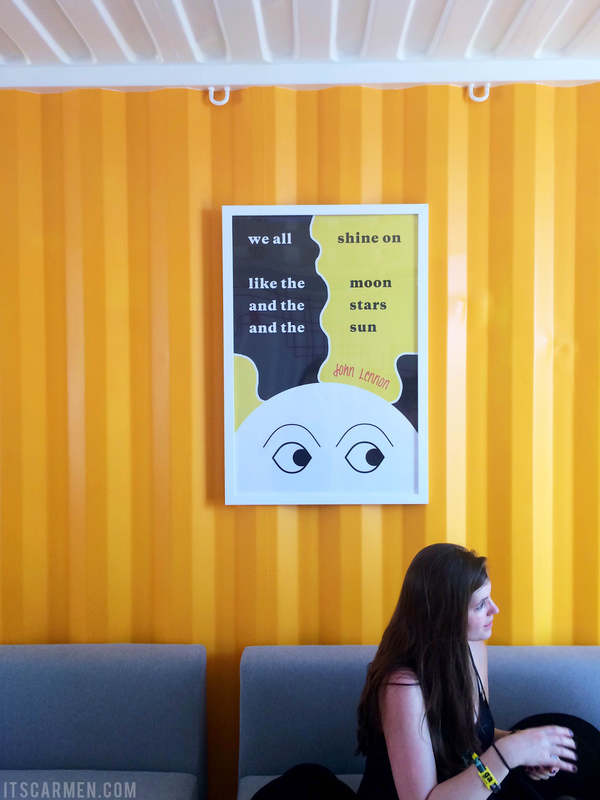 The inside was air conditioned & ideal to cool off. 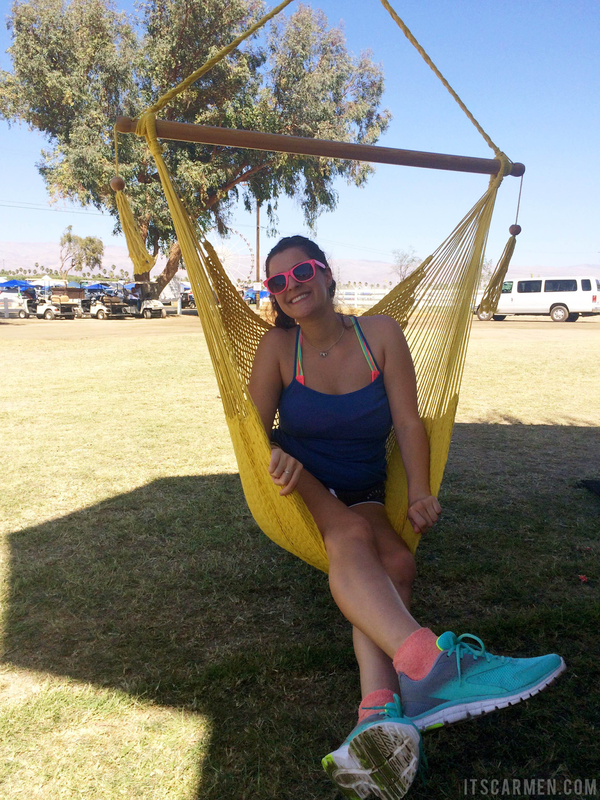 There was seating, speakers, & little hammocks to hang out in. 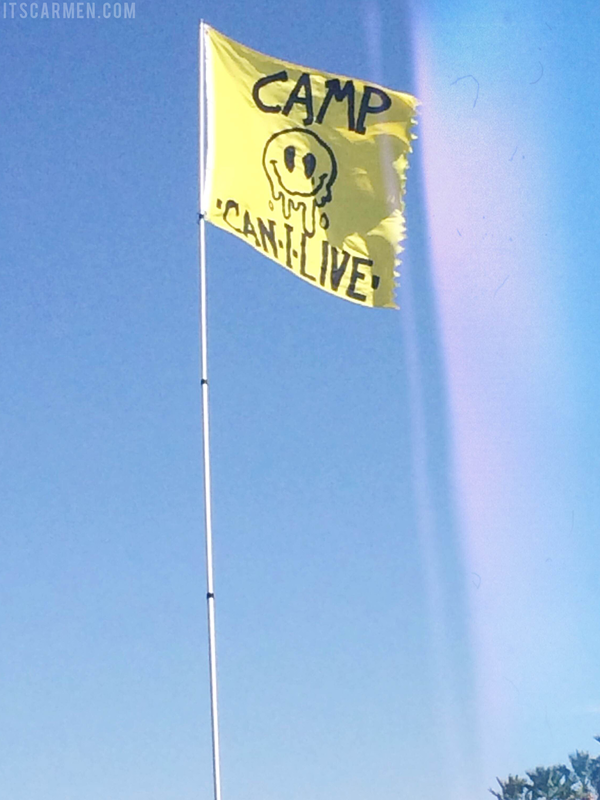 This was a prime choice for campers to chill after set up. 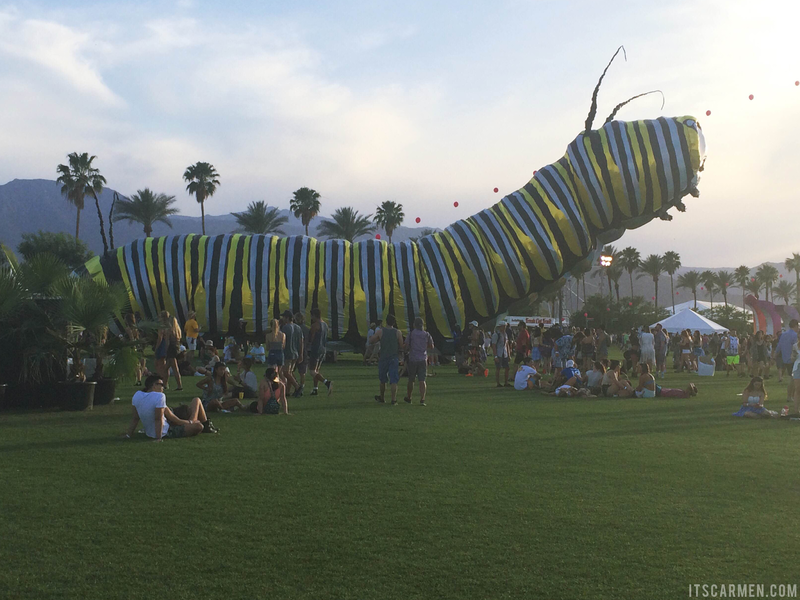 Coachella is an arts AND music festival. One of the wonderful aspects is taking a look at the enormous art pieces. 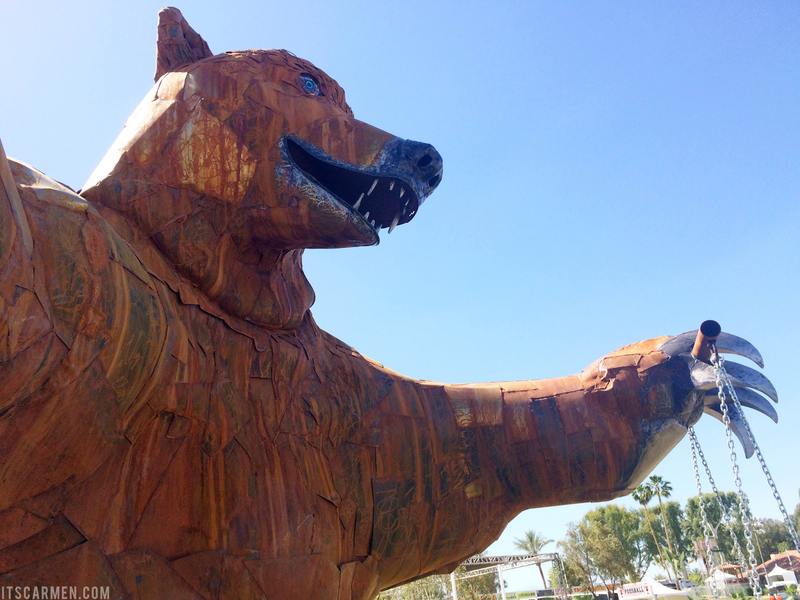 Big Bear by Don Kennell had a swing in his left hand where Coachella-goers could take a mini ride & in his right was a disco ball lantern. 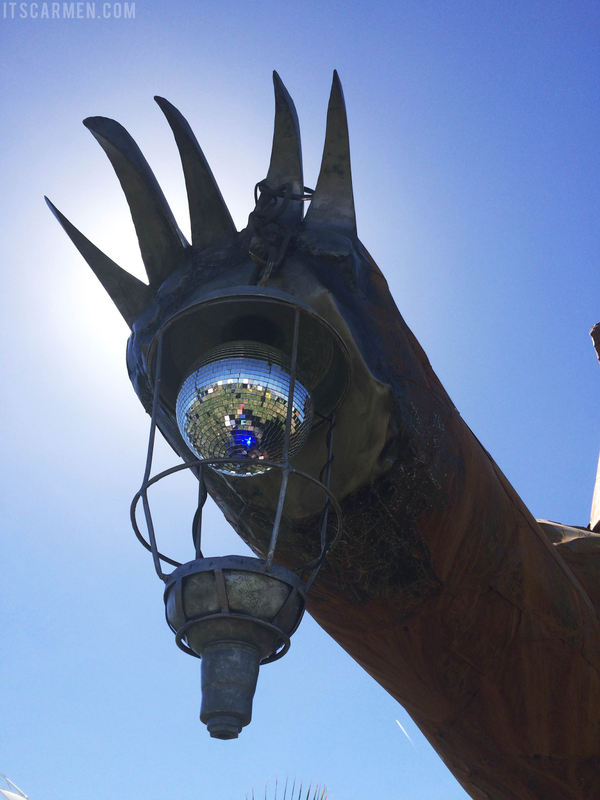 This steel-plated beauty pays homage to the California state animal & can be found in the camping area. The large caterpillar is called Papilio Merraculous by Poetic Kinetics. By Day 3 it turned into a butterfly (photos to come)! It's supposed to symbolize the ever-changing nature of earth: always growing, adapting, & evolving. Located within the venue. Now this piece is called The Corporate Headquarters by Derek Doublin & Vanessa Bonet. 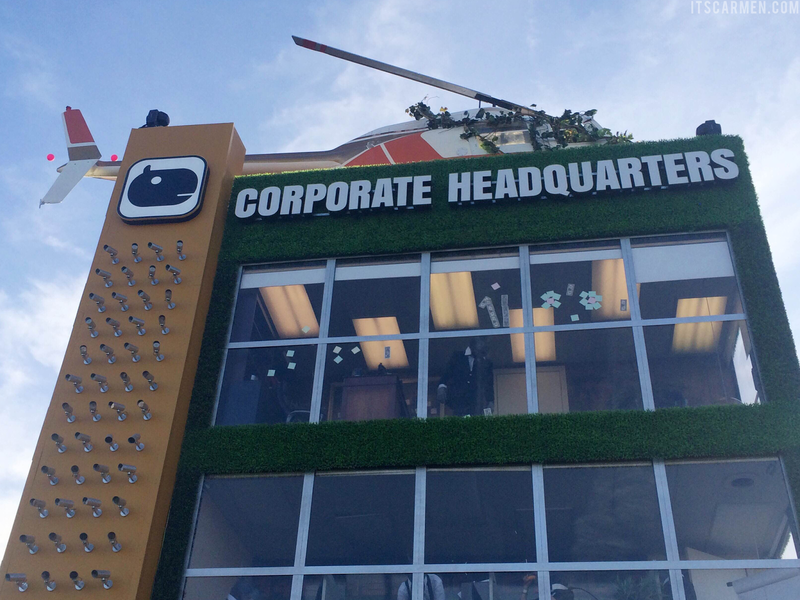 The installation is a mock office building with 3 functioning floors (over 3 1/2 stories or 38 feet tall) & a full-size Jet Ranger helicopter on the roof. You can see many cameras staring back at you. 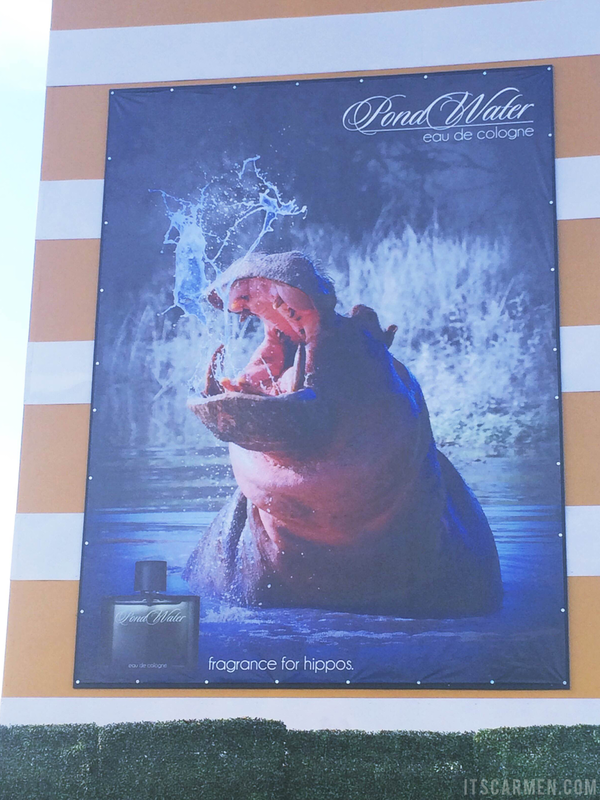 On all three stories are corporate associates "working" with a hippo masks on. It was fun to check back throughout the day(s) to see what shenanigans the hippos were up to. I thought there was going to be some sort of climax but this was the gist of the whole art piece. I believe it was meant to show corporate sponsorship & how it affects workers & the outside world. And now for the music. 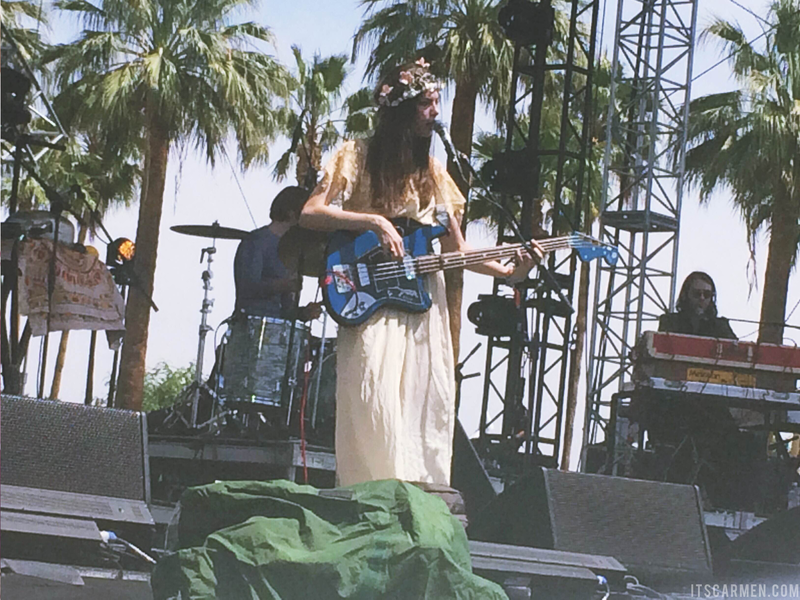 Boyfriend & I first ventured off to see The Ghost of a Saber Tooth Tiger (The GOASTT) with Sean Lennon & Charlotte Kemp Muhl at the Outdoor Theatre from 12 - 12:40. 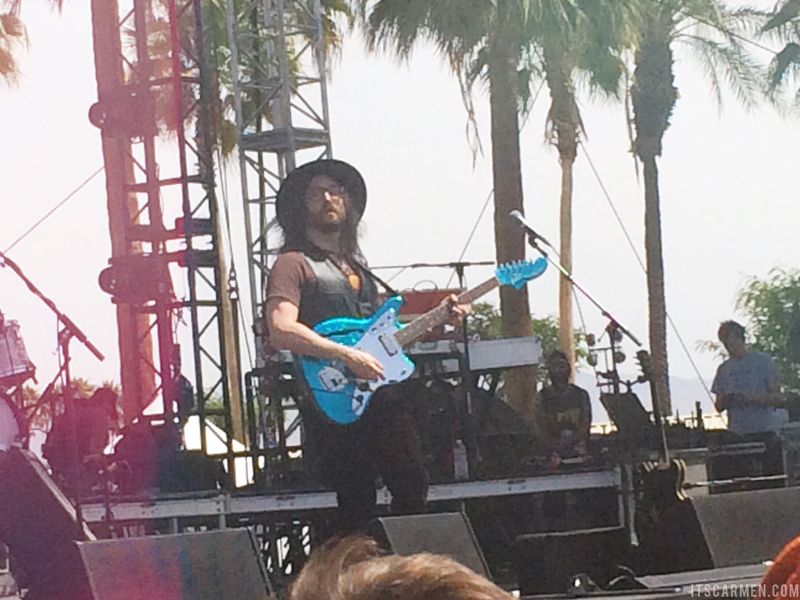 Yes, Sean Lennon is John Lennon's son & his voice sounds strikingly similar. I even shed one tear -- then I shed 12 more tears because my first tear caused the sunscreen to drip into my eye. The GOASTT was amazing live & gave off an eerie psychedelic vibe. Lennon's guitar shredding skills were superb. Kemp looked like a gorgeous bohemian bass-playing princess. 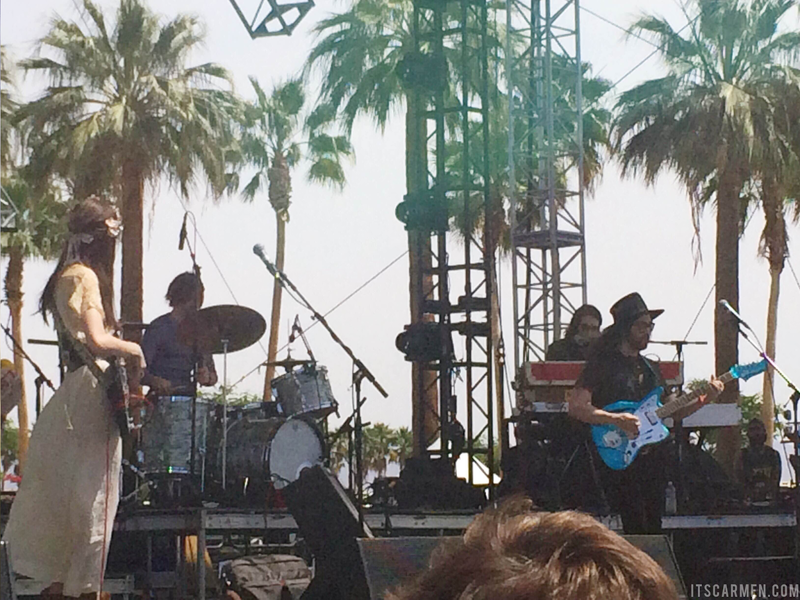 Definitely a top favorite act from Coachella. 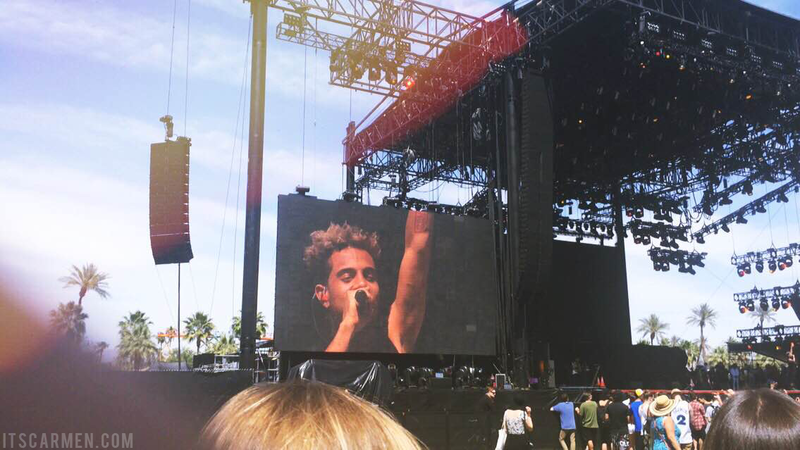 Next up was Vic Mensa at the Coachella Stage from 1:20 - 2:05. His set was upbeat & personal. Although I was far back, Mensa gave a killer performance & engaged with his audience. I didn't know much about him prior to viewing him live, but I'm glad I went. Torn between Lil B or Ab-Soul, boyfriend & I opted for the latter. 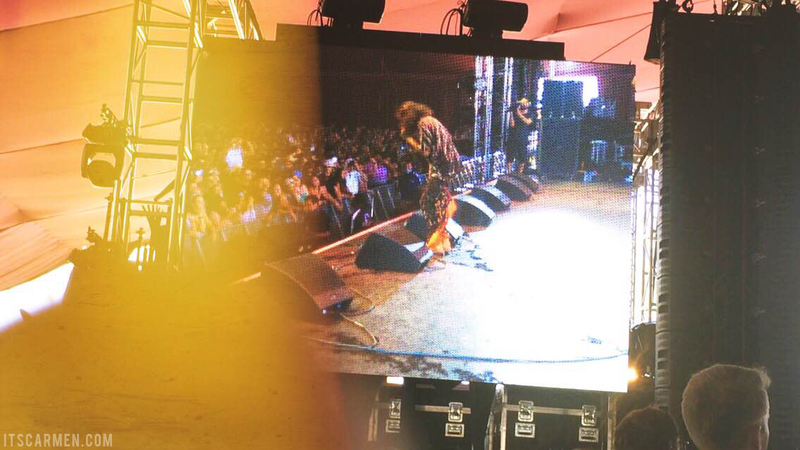 We saw hip hop artist Ab-Soul at the Gobi tent from 3 - 3:50. 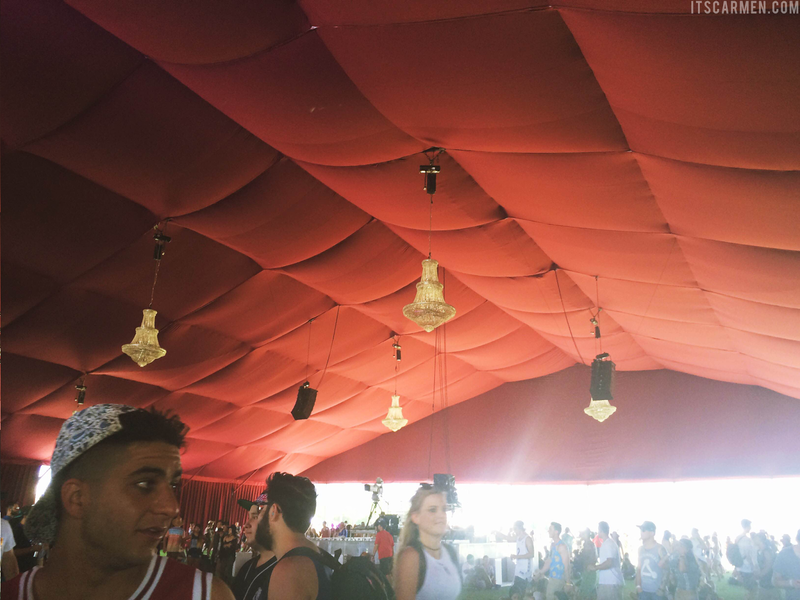 The shaded stage was decorated with a red ceiling & several chandeliers. Quite chic. Ab-Soul is part of the Top Dawg Entertainment label with Kendrick Lamar, Jay Rock, & Schoolboy Q. Prior to seeing Azealia Banks, I witnessed Charles Bradley and His Extraordinaires. He brought so much soul to Coachella. I don't have any photos but he did hand me a rose at the end of his performance; I'm trying to find the footage. 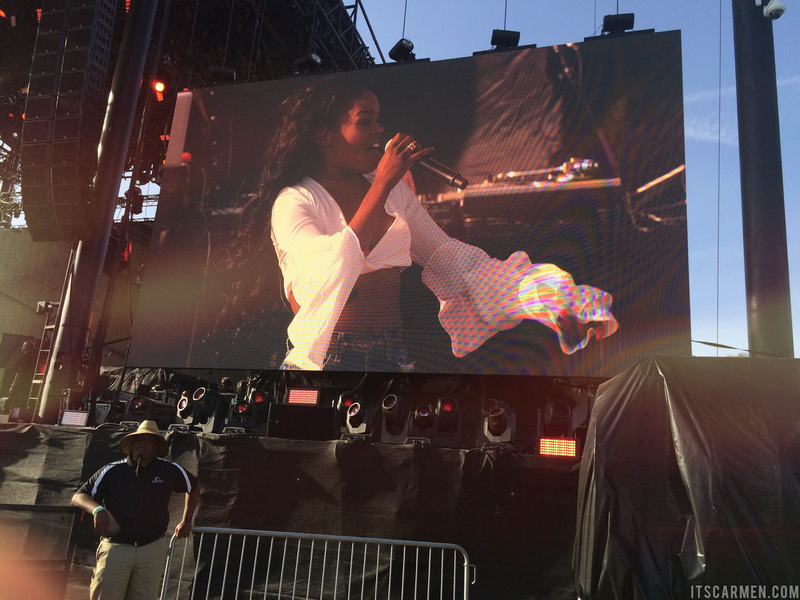 At the same Coachella Stage as Charles Bradley was Azealia Banks who performed at 5 - 5:45. Banks' performance was energetic; I'm excited to have finally caught her live. Her backup dancers brought a little extra oomph. Her beats were on point & she ended her set with crowd favorite, 212. Later on Day 1 we saw Interpol, a little bit of Caribou, Tame Impala, & AC/DC. As the night wore on, the crowds grew. Getting up front was a laborious task so to save energy we ended up off to the side or sitting in the back. Restrooms were atrocious. Waiting 15 minutes to pee when you feel like you're about to explode is not fun. It's less amusing when there's actual feces on the toilet seat (likely because there were masses of people -- some of whom were very drunk or on some sort of drugs). There were several bathroom areas within the venue. Most of which were Port-O-Pottys. 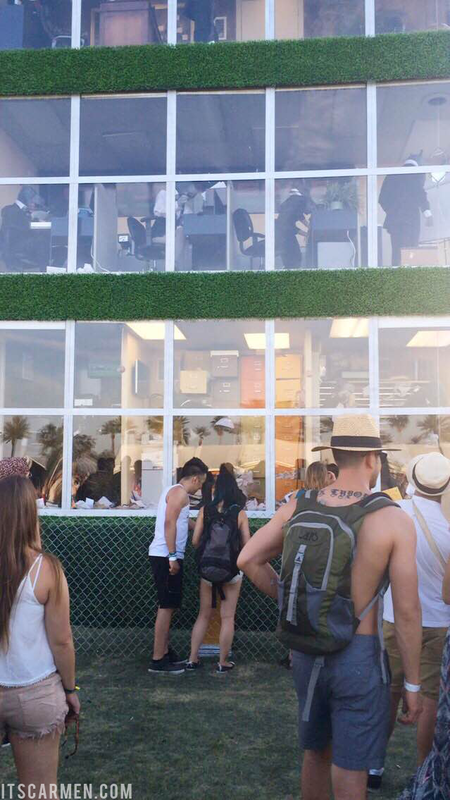 This year Coachella debuted permanent bathrooms with actual toilets, doors, sinks, & best of all soap! Day 1 was the busiest day for bathrooms, with lines up to 15 minutes long. I've always wanted to go to Coachella! This post almost made me feel like I was there, can't wait for the next days. Soo jealous you went! Looks like it was a lot fun! They have such weird art/sculpture there hahaha. Giant caterpillar? i love reading all these coachella posts even though i'm really jealous! 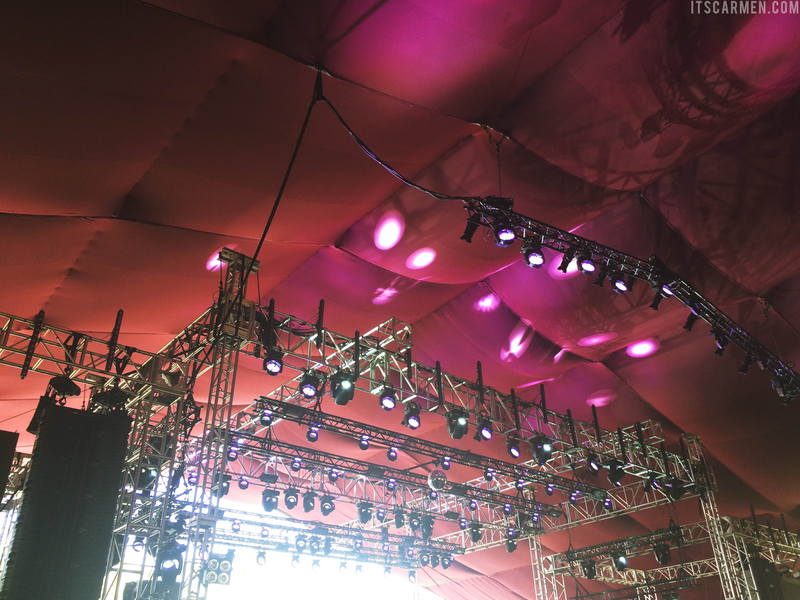 i love how coachella puts together art,music and fun. p.s. first photo is awesome! I've always wanted to go here, love your photos! Beautiful photos...it looks like it was such a fun event! I am soooo jealous :) It must have been a hell of a trip wow !! Looks like a great time! I've never been, and your photos shared more than what the media typically shows you. Loved it! I'm so jealous! But I've experienced festival bathrooms as well, not fun at all! I was lucky enough to have a VIP ticket for one, and the VIP area had better bathrooms. Still yucky though. Great photos, every year I say to myself I would go and I am always somewhere in Europe at that time. Very cool :) great pics! i went last year but decided to skip this year as i wasn't thrilled about the lineup. looks good from your photos though! don't even get me started on the bathrooms, easily the worst part! the event look very amazing and I always wondering about the bathroom at Coachella because in the maps they don't explain very well about it, and yes it's not funny when you must waiting for 15 minutes! I'm glad you're back and it's nice to know that you had a blast during your birthday. This is my first time to visit your blog, and I love it! I mainly come by and say hi. I am a new blogger so browsing around blogs and blogs, I am trying to build up my blog. 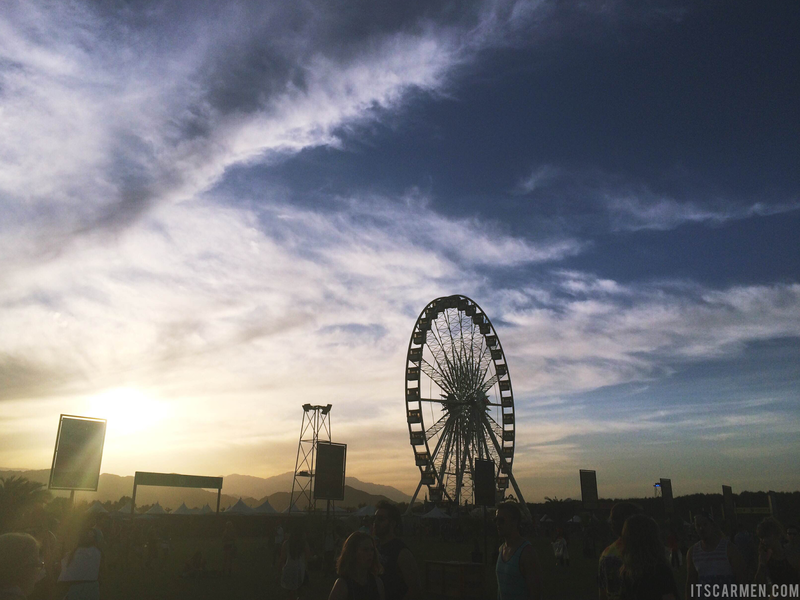 The Coachella looks SO COOL :) I hope I can go to this event one day! You are so lucky! I will go to Coachella one day as well. 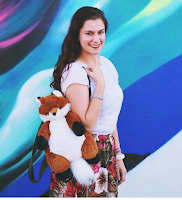 This is my first visit to your blog and I'm enjoying my time here... especially since we're SoCal neighbors! I went to Coachella back in 2004 - 2006. It has changed and blown up so much more since then. I always enjoy reading about people's trips and seeing their photos. It's an experience! This sounds like an amazing first day and all of your details really make me feel like I was there! Looks like an awesome experience! I have yet to hit such a big music festival, but hope to get the chance at some point! Fun , Food , Music...a Magic Mix !! !